Sear the filets for two to four minutes, which will cook the filet to medium rare and retain taste and tenderness. To test the doneness, press on them with a clean fingertip. 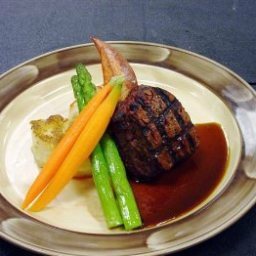 A filet cooked rare will leave an indention, a medium to medium-rare steak will give slightly but leave no imprint and a steak that is well done will be hard and solid.